Iceland will not feature in the Fifa 17 video game because of a cash row with developers Electronic Arts, says the country's football association (KSI). The KSI says EA's financial offer of 15,000 US dollars (£11,501) for their inclusion was below their expectations. 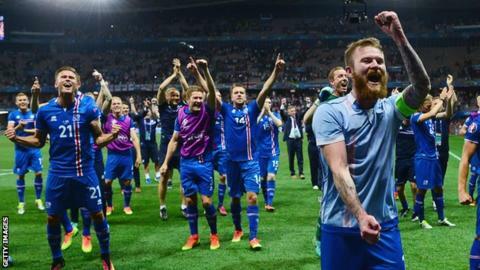 Iceland, who knocked England out of Euro 2016 in June, made a counter offer which they say was not accepted by EA. "They are the ones buying these rights and they almost want it for free," said KSI president Geir Thorsteinsson. "The performance at the Euros show that we are quite a good team and many would like to play with our team. It's sad for the players - but the criticism should be towards EA Sports." The fee that EA pays teams included in the game covers the use of trademarks and image rights. "I really feel if we are giving away rights, or offering rights, it has to be proper negotiations and fair fees." added Thorsteinsson. "I didn't feel that this was done in a fair and open manner." The BBC has asked EA for comment. Iceland, who are ranked 27th in the world, have not featured in previous editions of the game, but were hopeful of getting into latest version after their run to the quarter-finals of the European Championship this summer. A total of 47 men's international sides, including all of the home nations, will feature. India, who are 148th in the world, are the lowest ranked national side in the game.